The dangers of taking too much sun are well known. Quite apart from the long-term risks of serious disease, overexposure also toughens your skin, leaving it thicker, dryer, and more prone to wrinkles and fine lines. Sunscreen is the obvious solution. But while it’s certainly effective for protecting your skin from the sun’s ultraviolet rays, it also has its own risks if it’s overused. The chemicals and fragrances that most sunscreen products contain can dry your skin, provoke allergic reactions, and block the essential production of vitamin D.
And while the benefits of sun protection far outweigh these risks, many people would like to take a more natural route in day-to-day life rather coating their skin with chemical products too regularly. Here’s what to do. Although no natural products can compete with sunscreen lotions for protection in full sun, there are several that can be very useful as you go about your day in lighter sun conditions. Made from the nuts of an African tree called Vitellaria paradoxa, organic shea butter is used in many commercial sunscreens. In its pure form, it provides a sun protection factor (SPF) of between six and ten, and is a crucial part of any homemade sunscreen. Coconut oil provides a mild natural sun protection factor of between four and five, but more importantly, it also moisturizes your skin and helps prevent inflammation and heat rash. The oil pressed from raspberry seeds is high in polyphenols, a group of antioxidants that protect against ultraviolet light. However, it’s also rich in fatty acids, which give your skin greater suppleness and help prevent it from drying out. Widely sold in powder form, zinc oxide provides deep protection against ultraviolet rays. It’s useful as a full sun block on its own, but can also be mixed with other natural oils to provide stronger protection. All these ingredients can be used individually, but provide stronger synergistic protection when used in combination. However, none of these natural products provide the same level of protection as a high-factor screen or block. 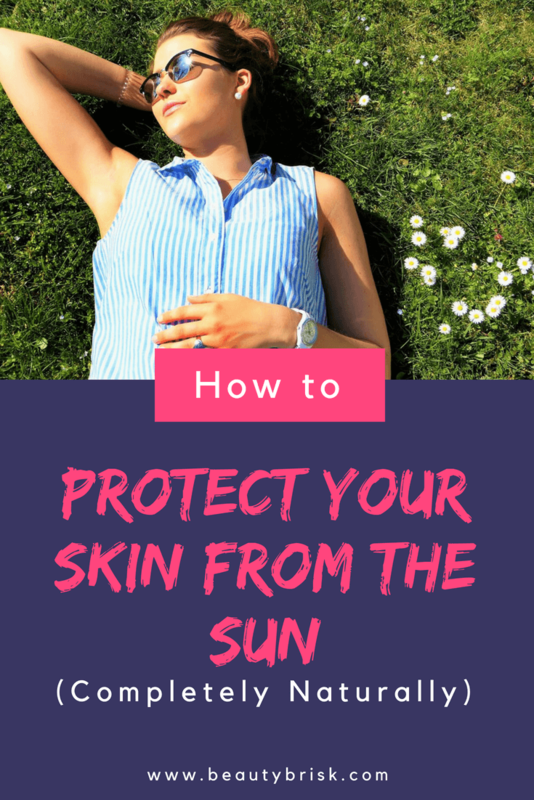 You should try to limit your sun exposure, but it’s also vital to boost your underlying skin health so that it copes more easily with the sun’s rays. One of the best ways to do this is through changing your diet to include more foods that naturally bolster your skin’s defenses. Tomatoes are packed with vitamins and other nutrients, but for sun protection the most important ingredient is lycopene, a carotenoid and antioxidant. This works as a powerful anti-inflammatory agent to reduce sunburn, and to repair skin cell damage caused by overexposure to ultraviolet light. If tomatoes aren’t to your taste, watermelons also provide high levels of lycopene. In addition, watermelon contains up to 92% water, as well as vitamins A and C, both of which keep your skin in supple, hydrated condition, and better able to withstand direct sun. Flax seeds are one of the best vegetarian sources of omega-3 fatty acids. These are essential for a smooth and well-moisturized skin, as well as helping to reduce inflammation. What’s more, they’re also thought to provide long-term protection against some forms of skin cancer. Often found in Indian and eastern cuisine, the spicy root of the turmeric plant can be added as a powder to give warmth and color to all kinds of soups, stews, and curries. But more importantly, it’s scientifically shown to protect the epidermis from ultraviolet-B radiation. What’s more, it also increases blood circulation to speed the healing of mild-to-moderate sunburn. As well as being packed with skin-friendly vitamins and minerals, leafy greens such as spinach and kale contain the antioxidant lutein. Laboratory tests show that this substance reduces the over-stimulation of skin cells by ultraviolet rays, helping to prevent inflammation and cellular damage. However, even with all these precautions, sometimes you’ll still be caught out in the sun for a little too long and pick up a mild burn. When this happens, quick treatment with natural cooling agents will keep your discomfort and swelling to a minimum. These four natural remedies can work just as well as any over the counter cream or lotion. Made from the leaves of a cactus-like plant, aloe vera gel has been used medicinally for burns and rashes throughout history, making it perfect for dealing with sunburn. Gently apply the gel to inflamed skin to soothe the pain, reduce swelling, and promote healing with less peeling or flaking. Cooling and soothing, live yogurt makes a great fast treatment for sunburned skin. Not only does it feel great, but it moisturizes parched skin, with its lactic acid helping to remove dead cells. It also contains natural antibacterial agents to prevent the tender skin from becoming infected. For an all-over body treatment for sunburn, pour a cup of apple cider vinegar into a cool bath. This will help soothe inflammation, quieten the itching, and gently cleanse the pores of harmful bacteria. Lastly, raw honey is packed with natural antibacterial and anti-inflammatory agents to reduce the symptoms of sunburn. However, it’s also a natural humectant that improves your skin’s moisture retention to reduce peeling and flaking. Gently massage pure honey into any lightly burned areas, leave for up to half an hour, and then rinse off with cool water. A healthy tan is one thing, but the dangers of too much sun are proven beyond doubt. If you’re planning a trip to the beach or the poolside, a high-factor sunscreen is the only sensible choice. However, for daily use to keep your skin in great condition under light sun, natural is often an ideal option.